william-james88 wrote: Every two weeks, Seibertron.com brings you list related to all things Transformers written by me, your fellow editor. These are personal opinions (just like movie or game reviews hosted by sites are still just the opinion of one person) so what matters most is what you guys think of the topic or list, and I hope to see your own lists or comments on omissions and ranking. Let's have fun! All previous lists can be found here. The Studio Series is a new initiative from Hasbro to give us a Generations Type line for characters from the live action Transformers films. It definitely had more coverage and attention than previous lines, especially with the angle that this would be more collector oriented (similar to Star Wars Black Series or Marvel Legends), along with being sold at a more premium MSRP. 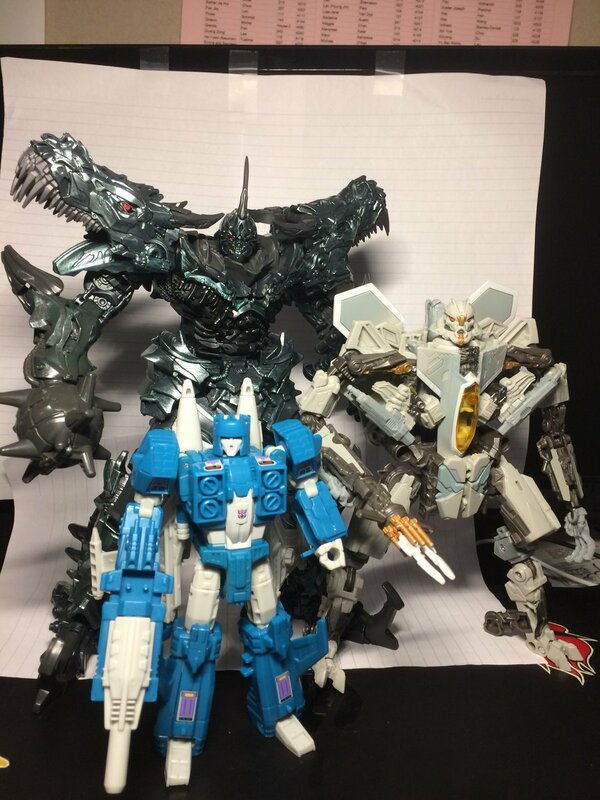 So, with wave 1 well in hand and wave 2 most probably dropping next month, I thought it would be a great time to look at what the line provided so far in comparison to what we were hoping for, by ranking every entry from wave 1 available at wide retail. A tiny detour from our usual top 5 lists but hopefully you still enjoy it. Great list, William. the only one of these I'm interested in getting is Blackout. And yeah, that Bumblebee looks pretty damned dire all-around. Yikes! I'd love to see more lists like this, not just new lines, but old ones as well. Best 1984 G1 figure, best Beast Wars Transmetals, stuff like that. I've softened up a bit on Bumblebee. It's still annoying how easily his roof pops off, but the figure looks very good and the smaller size looks great on display with other properly scaled figures. It's certainly miles above the original 2007 version of "Beater Bee." I like Ratchet quite a bit over all previous attempts at him, even the deluxe versions from 2010 and Dark of the Moon. He's just about the right size (though still just a tad small for my tastes). I don't think the Studio Series version is really lacking so much in paint apps either. He's got almost all of the detail he should, honestly. The alt mode looks spot on, the headlights and other small vehicle details are well painted, and he's got gray and black color for robot mode in all the right places. 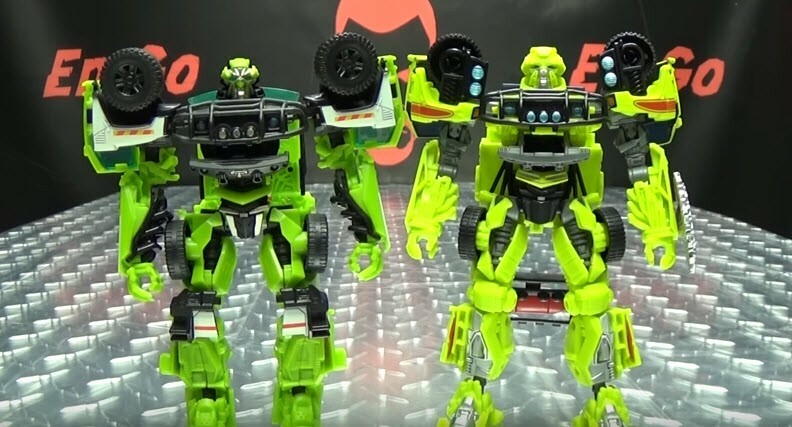 I think the real issue is that Ratchet is just very plain, even on screen, being primarily a very unappealing color (e.g., chartreuse). Backpacks never really upset me all that much on figures either, so the roof cage draped down his back in robot mode is not a big issue to me. Stinger is my favorite deluxe so far. I kinda like the car hood turned "stinger" in robot mode. 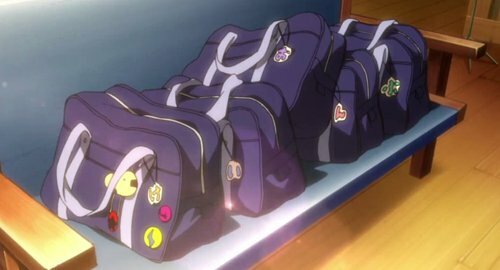 It was a creative way to make use of his mass and avoid having a huge backpack or lots of hanging panels. His car mode is excellent, too. Honestly, it totally replaces the deluxe Movie Advanced version from Age of Extinction, being just a red Bumblebee repaint. 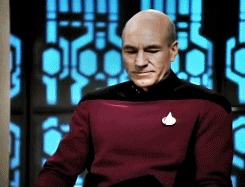 I'm with Willy on the Voyager and Leader figures, though. Starscream is wonderful! Blackout is so much better than his Voyager version from 11 years ago. 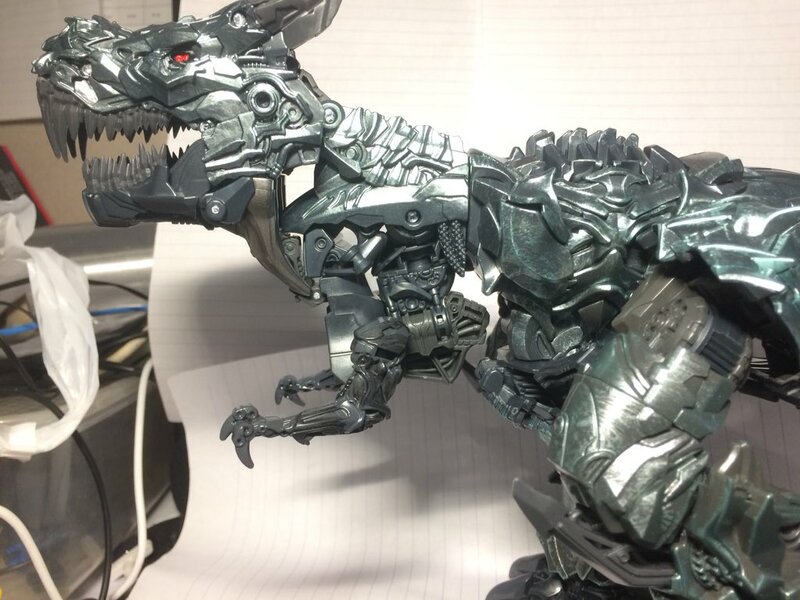 Grimlock is the Leader scale figure we've wanted since Age of Extinction. Optimus is a disappointment as a display figure, though. I do admit that his transformation is very fun. I brought him to work a while back just to have him to fiddle with on my desk. 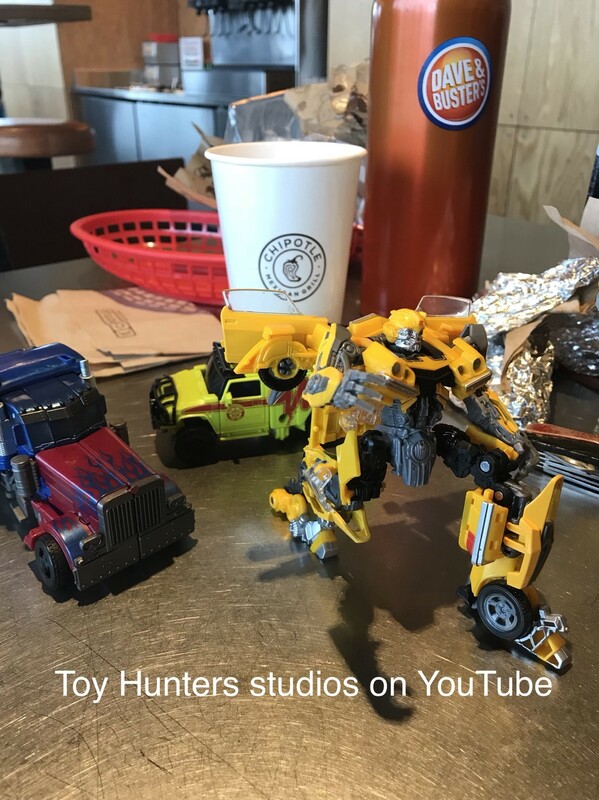 I think the Studio Series is off to a great start. I'm excited to see what they can do with the likes of Barricade down the line. Until then, bring on Jazz, Lockdown, Megatron, and Brawl! 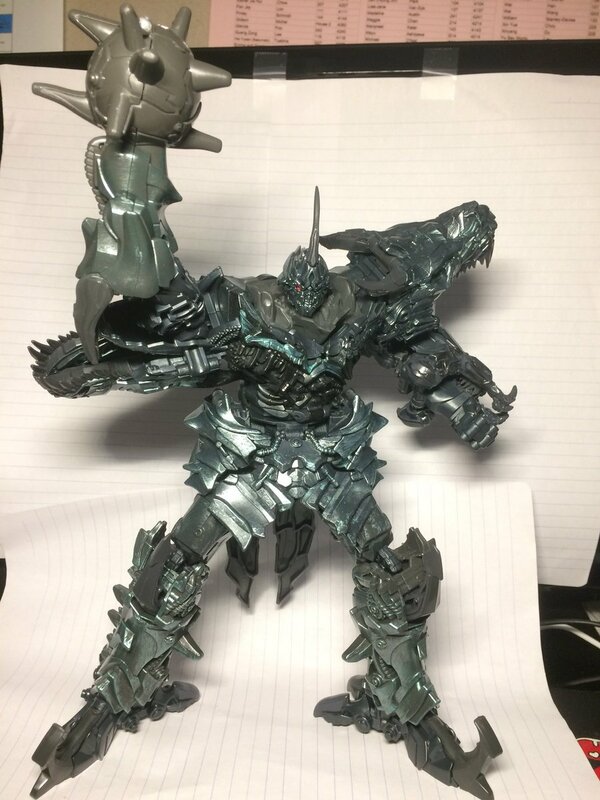 I liked the top, the new mold of Grimlock is a jewel, I would not be surprised if in the future reuse that mold for an MP Movie. 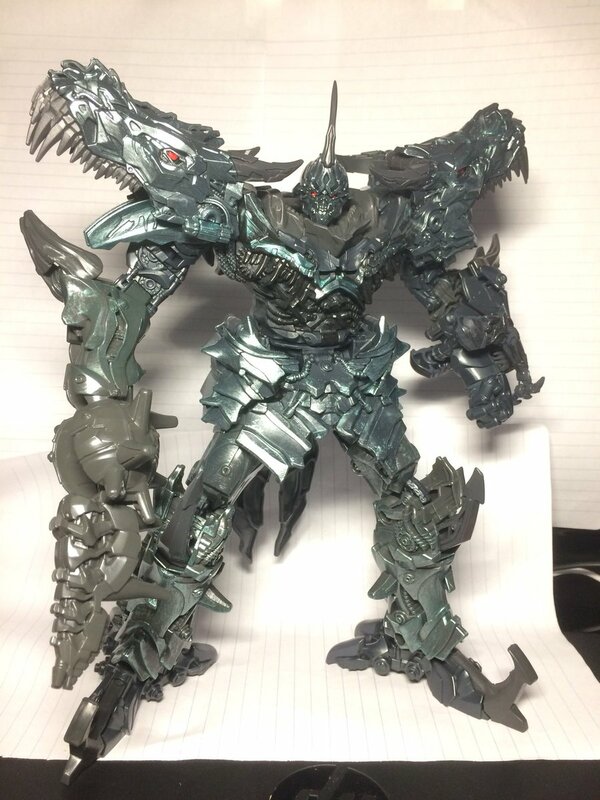 Seems like it's just me, and I don't really want to be a downer on a figure so many people love, but Grimlock isn't reeeally doing it for me? I picked him up a couple hours ago and while he's not bad at all, he doesn't feel like the crowning masterpiece I'd seen him hyped up as. That doesn't mean there isn't plenty to love! His robot mode, weirdly-angled elbows aside, is absolutely killer! Barely any kibble (and nothing obtrusive), astounding paintwork, and the detail is crisp and beautiful to looks at. (The painting and the sculpting on this figure is awesome!) Of course the double-head is everybody's big thing, and yeah I agree it's cool but I guess I never really minded him having a half-head on each shoulder in previous toys. I am a little bothered by his mace-hand - it reminds me of Animated Leader Bulkhead, and how annoyed I was that he didn't just have two hands - but it's not a deal-breaker. What is a little more of a deal-breaker to me, sadly, is the dinosaur mode. 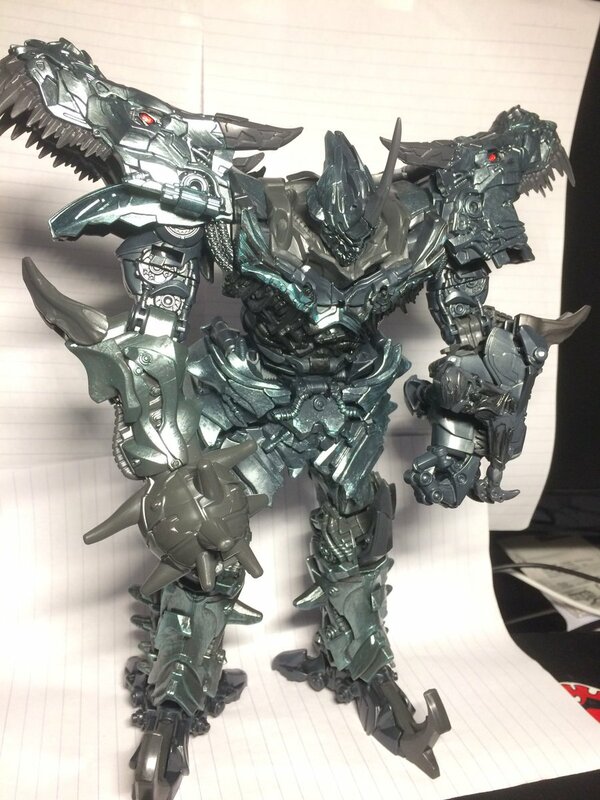 From certain angles, it looks absolutely incredible, and it's impossible to imagine a transforming Grimlock looking any better! But from other angles... yeesh, his neck is just kind of terrible. Gappy, thin, and yet another Grimlock whose dino arms just look wrong. 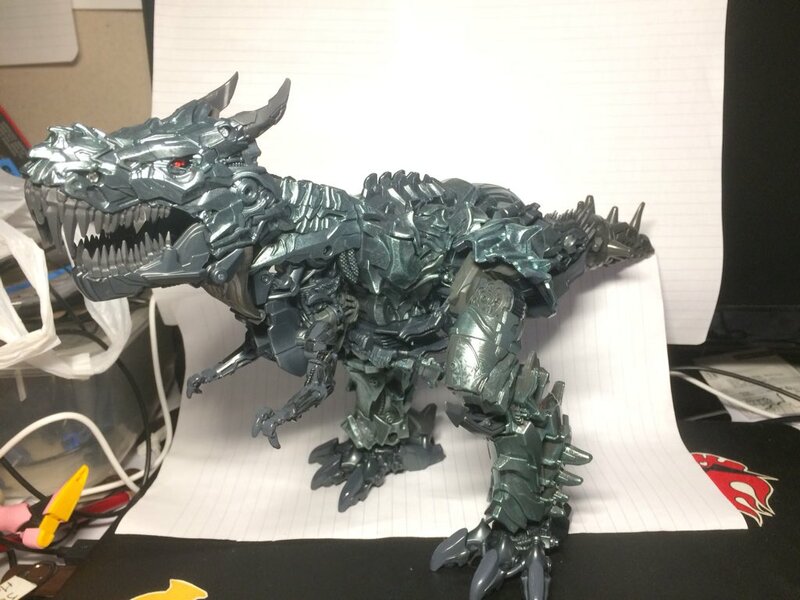 If I think of him as a skeletal T-Rex instead of a "living" one I can give it a bit of a pass, but what I'd really like to see is a Grimlock where I don't have to justify "giving it a pass". But of course, he is the best Movie Grimlock we've ever had. I won't deny that. He's fun, he's a joy to look at (in robot mode), oh yeah and he's MASSIVE (he actually almost stacks up to ROTF Leader Prime!!). But out of the two Studio Series toys I now own, I think Starscream is still my favorite by a considerable margin. Qwan - I largely agree with you. Starscream is my favorite SS figure as well. Grimlock is nice but maybe a bit over-hyped. I'm 1000% on the "Grimlock is over hyped" train. It is by no means a bad figure, but the best in the line? Hell no. I also don't get the hate for Bumblebee. Maybe I just lucked out and got a good figure. I dunno, but I didn't have the issues so many others seem to have. Carnivius_Prime wrote: Ratchet I can't decide on. 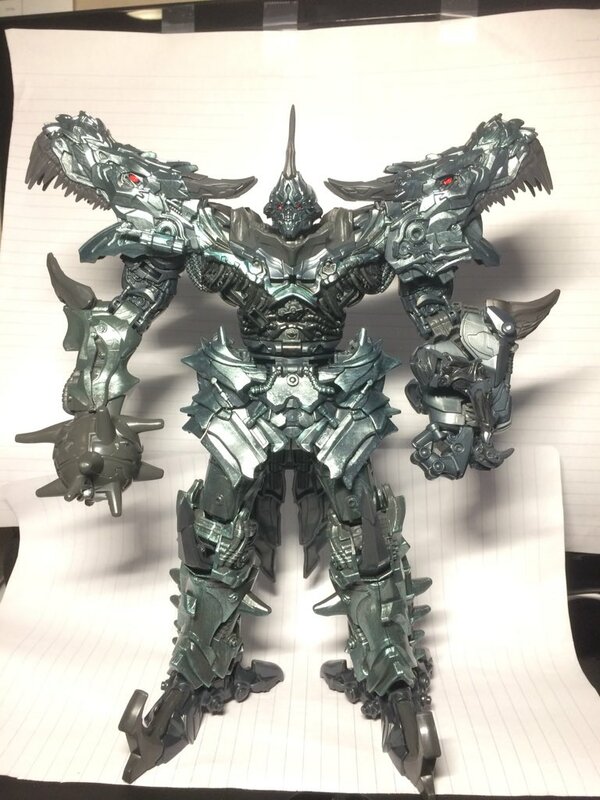 There's aspects of the smaller DotM figure I like more and aspects of this one I prefer too. They seem about the same size to me, depending on the pose. Have you placed them side to side youself? 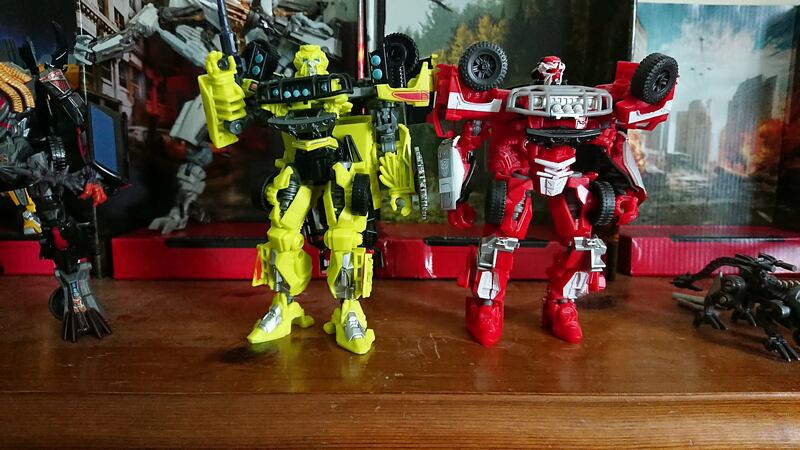 Putting these two side-by-side just emphasizes that Studio Series Ratchet really isn't lacking at all in the paint apps department. He's got just about everything the Dark of the Moon figure has, and more, particularly on the front grill, bumper, and headlights. 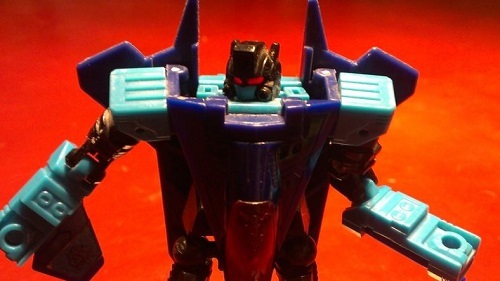 The newer mold even has some new tricks, like getting the lights up on the shoulders for robot mode. About the only advantage to the DotM figure, really, is the lack of the roof cage "cape." Not lacking in quantity of paint apps themselves, or even number necessarily. What he lacks is more like what I'd call "color separation" - notice how DOTM Ratchet's forearms and head are broken up with plenty of gunmetal/black, where SS Ratchet just has vast seas of bright green instead. Same with the shoulders, where the white on DOTM breaks up the other colors, but SS just puts red decals right on top of the green and leaves it at that. I don't remember the movies well enough to tell you which is more accurate color-wise, but in terms of what looks better to my eyes, DOTM Ratchet uses his colors way better to create a much more appealing-looking toy. They're both accurate to their respective movies. Ratchet's on-screen deco looked like the Studio Series figure in the first two movies. When Dark of the Moon came around, Ratchet got a deco overhaul with a lot more large swaths of white paint to break up all the chartreuse. I said so above, and I'll say it once more: this is just how Ratchet looks, for better or worse. 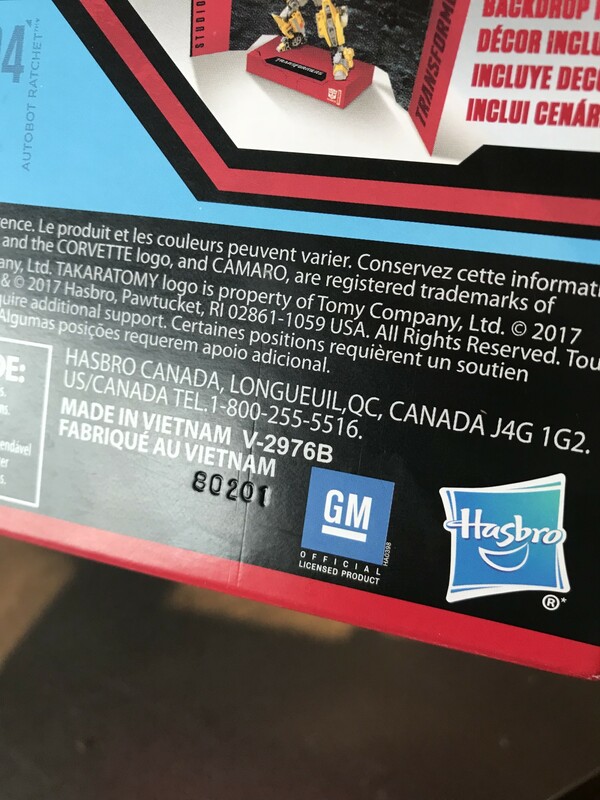 You can't fault Hasbro and Takara for making a screen accurate toy in a line that's supposed to be all about screen accuracy. Wolfman Jake wrote: Putting these two side-by-side just emphasizes that Studio Series Ratchet really isn't lacking at all in the paint apps department. He's got just about everything the Dark of the Moon figure has, and more, particularly on the front grill, bumper, and headlights. The newer mold even has some new tricks, like getting the lights up on the shoulders for robot mode. About the only advantage to the DotM figure, really, is the lack of the roof cage "cape." Ah, if that's how he actually does look then fair enough! Can't fault them for trying to be screen-accurate. In that case, I guess I just vastly prefer Ratchet's DOTM look over his original one - thanks for clearing that up for everyone too lazy to check (read: me). Speaking of Ratchet his leg popped off today. I popped it back on with no issue. Balmatrix said his hips were loose on his copy of the figure. I am wondering if that is because it is kinda a pita to fold his legs into the back of the patient compartment due to it being square. If I were Hasbro I would design them to pop off rather than have the hip joint snap under stress. It does also make me wonder if the older DOTM/Movie Ratchets were not designed with looser parts as a lot of the ones I saw on eBay have a lot of missing parts. (I would guess that if a part could be popped back on the owner would have done so before selling). Might be chasing rabbits here but can anyone verify? Its about at the 34s mark that he notes the loose hips. Ratchet is a grumpy ol bot so be careful with his joints haha. 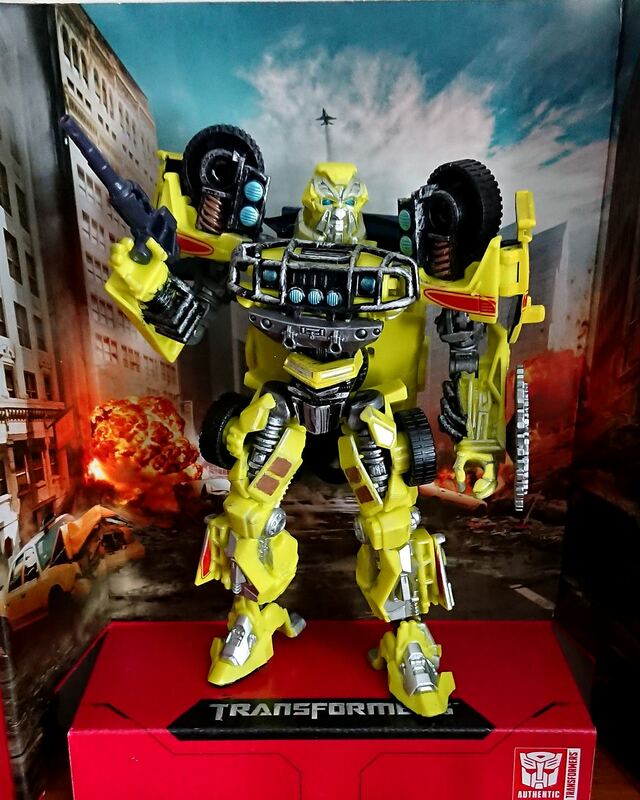 Thanks to a tip from regular news source Scottimus Prime Toy Hunter, we have what seems to be confirmation of a second run for the Transformers Studio Series Bumblebee deluxe figure, fixing some of the quality concerns that affected the figure in the first place: loose joints, loose window attachment, loose feet, among others. The second run code appears to be 80201 - so do check your figure to see if there is a difference, and if this later code batch has indeed fixed all the issues! 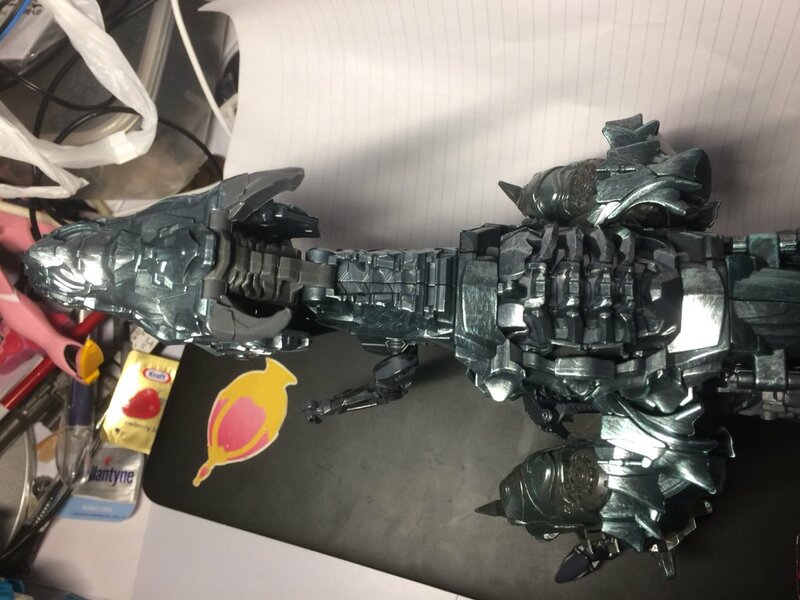 the studio series bee does have second running of it check the code on the back, mines 80201 check yours from the first run. Another really nice list, William-James. Think I agree with almost everything in terms of pros and cons, just to varying degrees. Some things bother me more. Some things less. I think that me liking Prime as much as I do, really makes me the odd one out. After fixing Bee’s backpack, I’ve started to come around on the figure. He’s better than I first thought, but overall he’s still not great. Blackout continues to be, far and away, my personal favorite. I’m sincerely hoping we get a Grindor. I want more helicopters. I’m curious to see what your top list will look like when the whole SS line is all wrapped up. Am I the only one who had a Starscream with a floppy crotch? Anyway, after a couple of Pledge Floor Finish everywhere it's not tight, but it's not floppy anymore. -Kanrabat- wrote: Am I the only one who had a Starscream with a floppy crotch? My Starscream was more than fine - it's (theoretically) got soft-snapping points because of the hinge's non-rounded shape, so it's not going anywhere on my copy. Glad to hear yours was mostly fixable at least! Mine's left shoulder doesn't quite line up, though. That perpendicular panel on the wing that's supposed to sit right under the shoulder-block (does that make sense?) doesn't do it on that side, and instead sits behind that part and pushes it forward a bit. Totally unnoticeable unless I think about it or look at him from the top in robot mode, luckily. 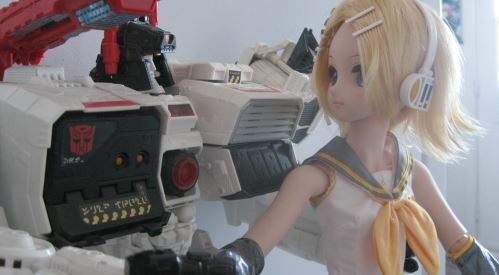 Well yeah, it was one of the first things I did when I got SS Ratchet and so just took another photo now. The DOTM mold can't stand it's legs up totally straight in the hips or the knees either. Hm didn't realise on the SS figure there are actual tabs in the shoulders to fix the wheel panel things in securely in robot mode. I thought they just folded in and that was that like on the old figure. Anyways I wanna do some painting on this figure. Nothing much, just add some to the head, foreharms and knees and inner thighs and such. did some rough painting. Will clean it up later. Way overdid the silver on the..whatever you call the bit on the front of the vehicle hood. Will scrub that and redo that properly with drybrushing. Last edited by Carnivius_Prime on Mon May 07, 2018 6:07 am, edited 1 time in total. What has the world come too? Now all of a sudden everybody cares about Bumblebee. Dude even took pics from Chipotle lol. Isnt the same character we all crucified michael bay and hasbro for the last 10 years? Rated X wrote: What has the world come too? Now all of a sudden everybody cares about Bumblebee lol. 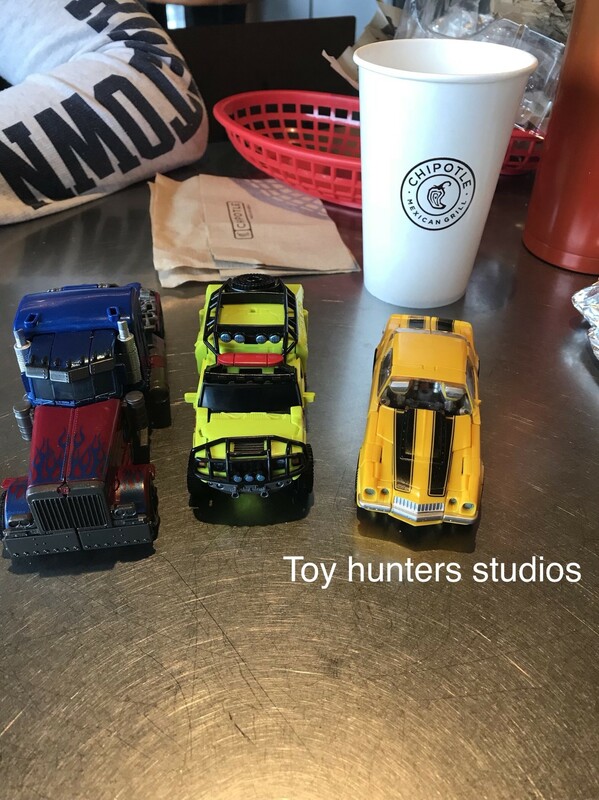 Dude even took pics from Chipotle lol. Isnt the same character we all crucified michael bay and hasbro for the last 10 years? Um. No. I've always loved movie Bumblebee. Sure there's maybe too much merchandise of him but that ain't his fault. My starscream has the same issue but its not that bad. He is easily my favorite starscream, movie or otherwise. Mine is slightly loose in that area but only notice it when transforming. It stays in place in both modes just fine. Carnivus, quick question, do you just paint straight onto the figure or do you prime it first? 4,771 pages were recently viewed by 723 unique visitors. This page was viewed 1 times on Wednesday, April 24th 2019 11:28am CDT. © 2019 Seibertron, Inc. DBA Seibertron.com. All Rights Reserved. Established June 2000. Seibertron.com is owned by Ryan Yzquierdo.